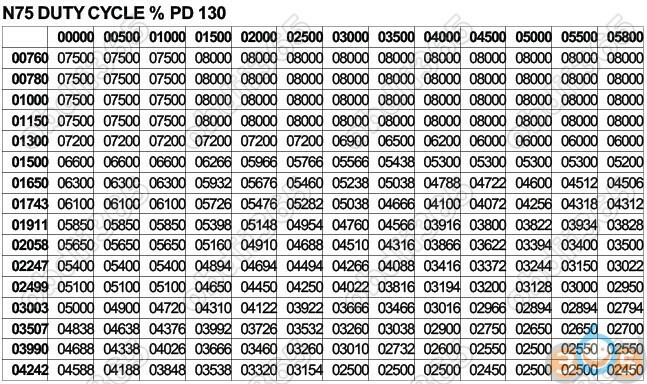 THIS PAGE DOES NOT TELL YOU HOW TO REMAP A PD 130 TO 150 BHP. 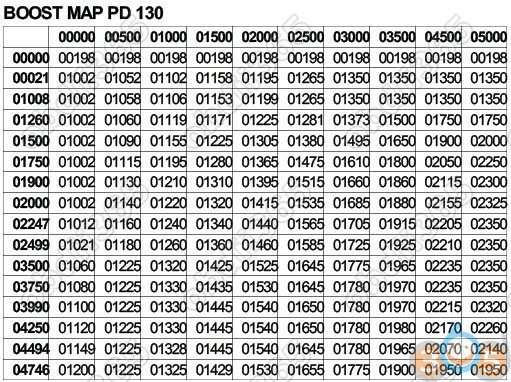 IT IS A COMPARISON OF SEAT LEON PD 130 & PD 150 FUEL AND TURBO MAPS. 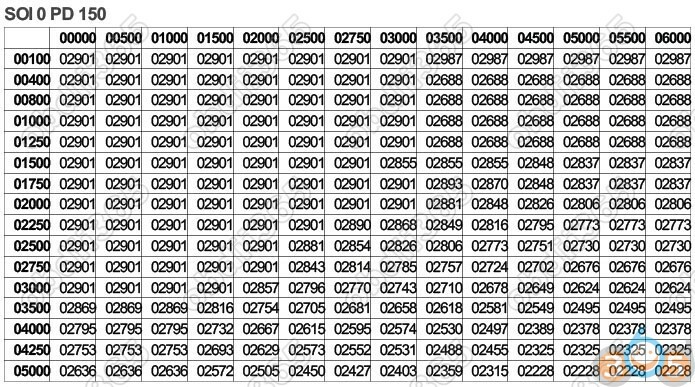 THIS COMPARISON SHOWS HOW SEAT CHANGED THE 130 BHP MAPS FOR THE 150 BHP ECU. IT IS UP TO YOU WHAT YOU DO WITH THIS INFORMATION. 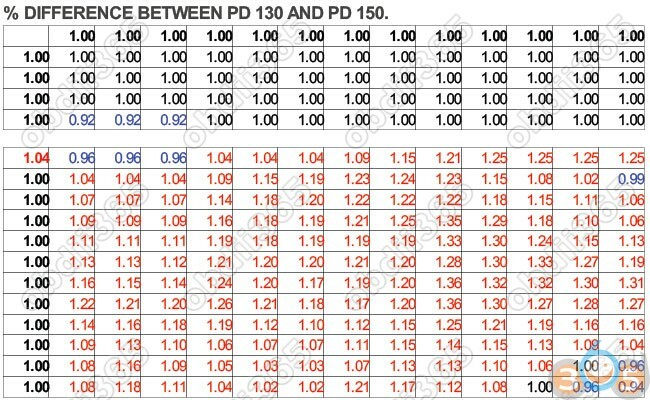 % DIFFERENCE TABLES SHOW PERCENTAGE DIFFERENCE BETWEEN 130 BHP AND 150 BHP. BLACK MEANS VALUES ARE UNCHANGED (1.00). RED MEANS VALUES INCREASED, BLUE MEANS VALUES DECREASED. AXES ARE X – ACROSS AND Y – DOWN. Z – AXIS IS TABLE DATA. 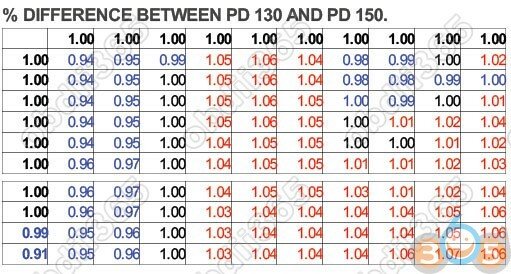 The Percentage difference chart shows that the axes are unchanged between 130 and 150 ECU’s. slightly earlier than the 130. 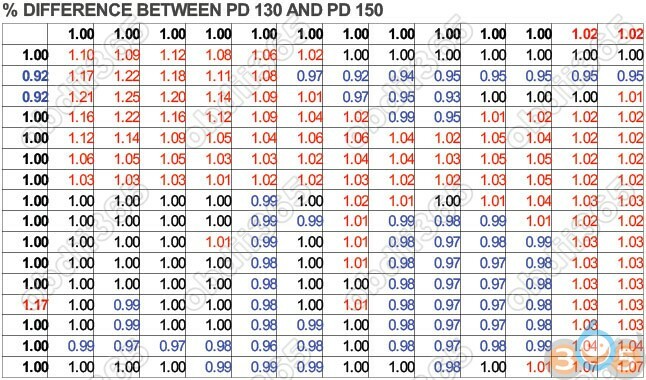 So the limiting I.Q factor for the PD 130 and 150, via Drivers wish is 70 mg/stroke. The X axis is alterd at the upper end to allow for higher Mass Air Flow rate. 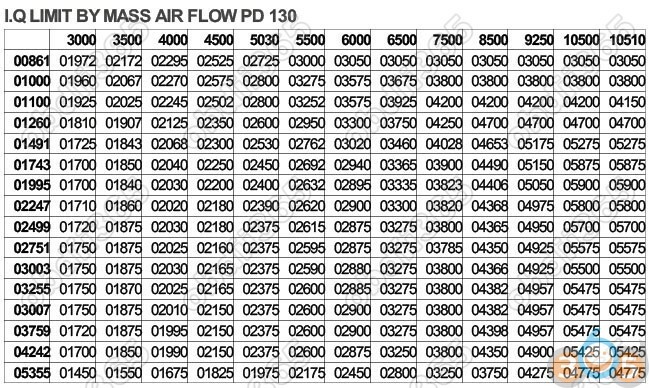 Overall you can see that the 150 has an increased I.Q at low rpm and low Mass Air Flow rate, but not at high rpm and low Mass Air Flow rate. 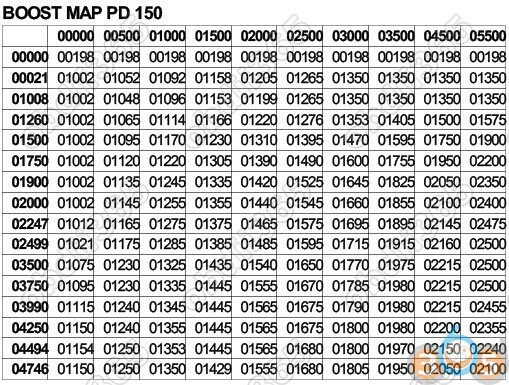 On the 130 map the maximum I.Q is limited to 59 mg/stroke by the MAF. On the 150 map the maximum I.Q is limited to 60 mg/stroke. So the I.Q difference between 130 and 150 is only 1 mg/stroke. Even if the Drivers wish requests an I.Q of 70 mg/stroke, it will be limited by the Mass Air Flow to 60 mg/stroke maximum. to reduce I.Q and indirectly turbo speed at lower air pressure. There is no point in having a higher I.Q below this 1900 RPM as their will not be enough air available. The 130 has a peak I.Q of 56 mg/stroke. This only increase to a maximum of 57.50 mg/stroke for the 150. So the 150 injects 3 to 10% more fuel per stroke than the 130. The Torque map limiting the maximum I.Q to 57.50 mg/stroke. this will then be limited by the Torque limiter to a maximum of 57.50 mg/stroke. 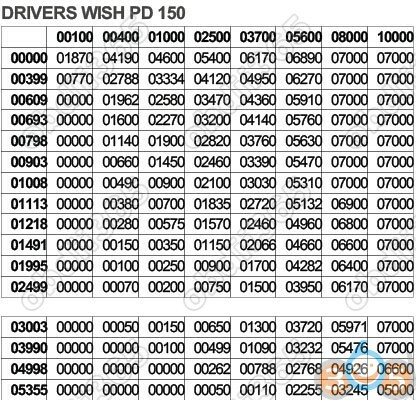 You don’t need to change the Drivers wish. It already requests up to 70 mg/stroke fuel, which is plenty. engine pull more strongly at low rpm. Beware increasing I.Q too much at low Mass Air Flow. If you do, you will get alot of black smoke. Changing Injection Quantity is not a simple thing. The engine ecu contains calibration maps which turn requested I.Q into actual fuel injection. The I.Q is made up of two main factors. spreadsheet download at the bottom of the page. 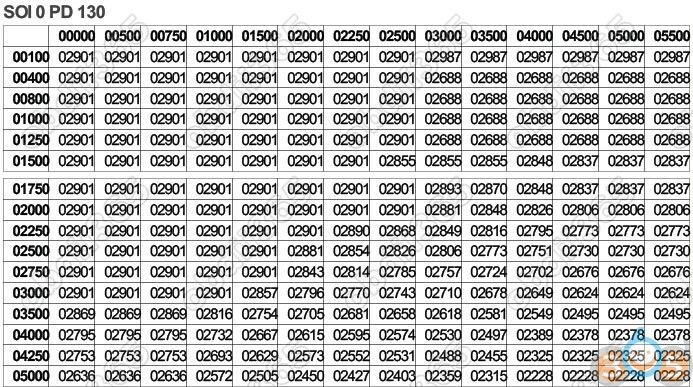 Duration and SOI maps are very hard to interpret. 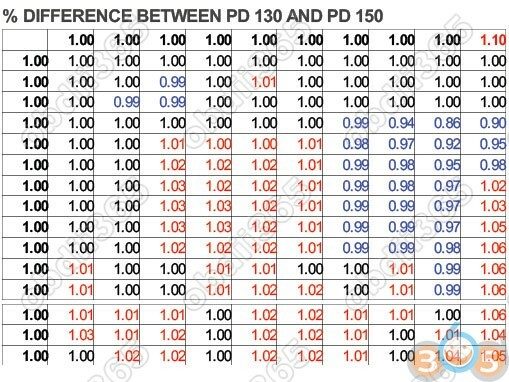 The % difference chart for SOI 0, pd 130 vs pd 150 shows almost no difference. All ten SOI maps show the same change. mg/stroke column at the end. More power from more fuel and more power due to advance in timing of start of injection. At this point, the fuelling is sorted and as you can see, it has not been altered by much. The Turbocharger consists of three maps. A turbocharger control valve map. A turbocharger Single Value Pressure Limiter. The chart data is a little different at middle RPM & I.Q. The main difference is the last column where boost is allowed to rise. 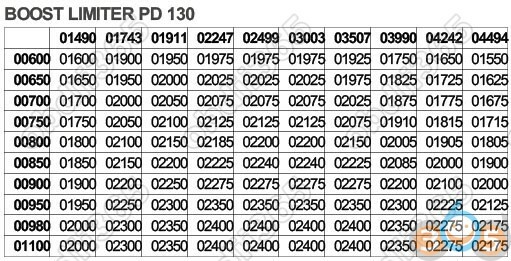 Maximum boost of 2350 mbar for the 130 is raised to a maximum of 2500 mbar in the 150. Most of the boost changes occur above 1500 rpm as this is when the turbocharger starts to spool up. This map controls the action of the turbocharger via the N75 solenoid and the turbocharger vacuum actuator. 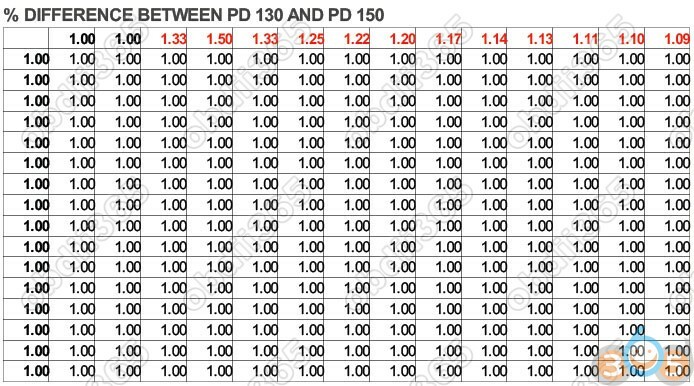 The % difference chart shows the axes are unchanged between the pd 130 and pd 150. At roughly 1500 rpm, exhaust pressure spools the turbocharger up to speed and boost increases. For the 130 boost will head towards it’s limit of 2350 mbars and on the 150 it will head towards it’s limit of 2500 mbars. The % difference chart shows that the 150 reduces boost LESS tan the 130 and so the boost pressure is kept higher in the 150. Turbocharger boost is limited by an atmospheric air pressure map and by a single maximum Single Value Boost Limit (SVBL). thinner so the turbocharger cannot compress enough air and will spin too fast as it tries. This will damage the turbocharger bearings. Obviously the designers feel that this extra 20 bhp is not too much strain for the engine. It is possible to increase bhp beyond 150 bhp. 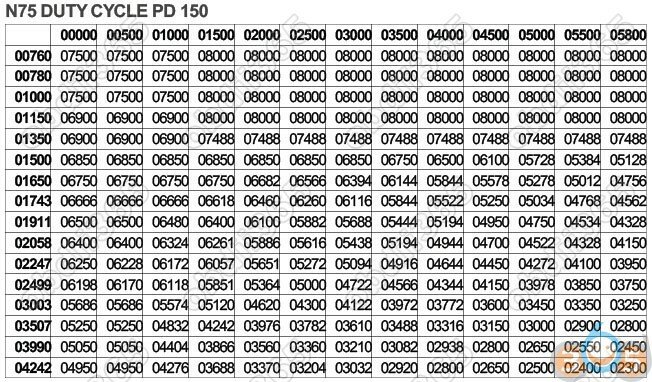 Many engine tuners claim to remap 1.9 pd tdi diesels from 130 to almost 180 bhp. 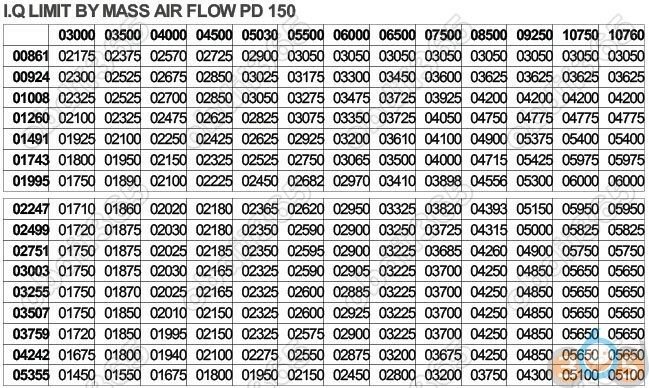 An .xls spreadsheet (raw data) version of the information above can be downloaded by clicking the blue arrow below. 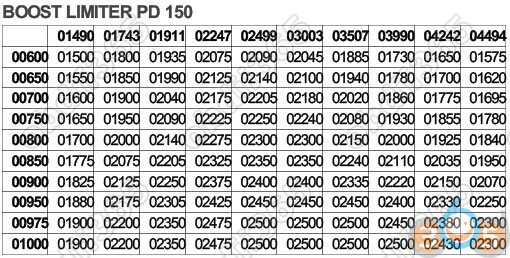 Disclaimer: This is a copy version, not originated from obdii365.com. Thought it helpful and share tutorial again.